This project goes with a slogan “Vietnam to produce more coffee with less water” and aims to ensure equitable and sufficient water availability in the Central Highlands of Vietnam and to significantly save water through improved irrigation management in the coffee sector. The activities run from July 2014 until June 2019 and will reach a critical mass of 50,000 farmers, improving people’s livelihoods and protecting the environment. To make coffee farming economically viable, water for irrigation is necessary to achieve yields that average 2.4 tons per hectare. However, people living in the Central Highlands of Vietnam are increasingly facing the challenges of drought and extreme water shortage. This threatens agricultural production, which not only affects community life, but also weakens the local economy. To better understand where and when drought may occur, the project assesses regional water availability and demand in Dak Lak province and proposes a strategy to cope with water scarcity in the dry season. To support farmers with decision making, the project is developing a regional short term weather forecast system for the Central Highlands. This optimizes farm management in terms of water, fertilizer and pesticide use. 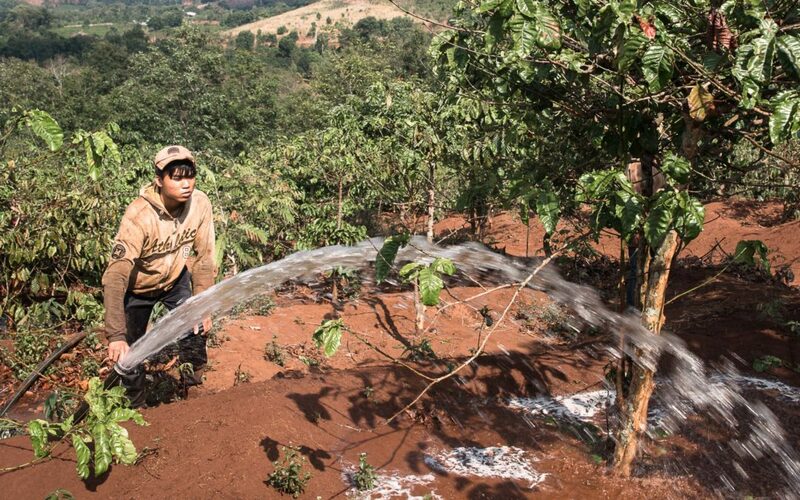 A large-scale farmer training program raises awareness among smallholder coffee farmers on rational water use and good agricultural practices. One of the purposes of this project is that it becomes a model of water efficiency and contribute to the international policy debate by sensitizing relevant policy makers through its results in form of policy papers.